“SIX-DAYS' RACE. Marred by Many Falls. COMPLAINTS ABOUT TRACK. At 4 a.m. to-day the Germans, Kilian and Vopel were leading in the six days' cycling race at WembIey, promoted by Mr. Hugh D. McIntosh, formerly of Sydney. Nine laps behind were the Western Australian brothers, Eddie and Harold Smith. A number of the riders have been injured. The Dutch brothers van Kempen, have so far won most or the sprints. Killian and Vopel were three laps ahead of their nearest rivals when 362 mlles had been covered. “SIX-DAYS' RACE. Australian Wins a Sprint. 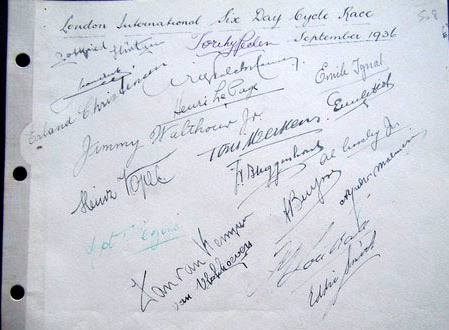 In the six days' cycling race at Wembley, promoted by Mr. Hugh D. Mcintosh, formerly of Sydney, the Germans, Kilian and Vopel, were still leading at 11 p.m., with the Western Australian brothers, Eddie and Harold Smith, in ninth place. At midnight the Smiths were nine laps behind the Germans, who were still leading. Sprint winners for prizes aggregating £150 included Eddie Smith. Malmesi (Italy) won Sir Malcolm Campbell's £50 prize for the fastest mile during the evening, his time being 2m 9s. Pecqueux (France) later did a mile in 2m 2s. “SIX-DAYS' RACE. Won by German Pair. Tho German team, Kilian and Vopel, won the six days' cycling race at the Wembley Stadium. The Belgians, J. Aerts and M. Buysse, were second, and the Frenchmen, Diot and Ignat, third. Kilian and Vopel won by a lap of the track. There was the same distance between second and third. Then came teams from America, Denmark, Belgium, Holland, and the Germans, Merkens and Hurtgen. The total mileage covered during the race was 1939. A total of 65,000 people paid admission. On the last night 12,000 were admitted, though prices were doubled, and many offered any price to get in. The referee, owing to the hopelessness of their position, withdrew the Spaniards, Demetrio and Prior (19 laps behind), the Frenchmen, Pecqueux and Torinelier (19 laps), and the Western Australians (Eddie and Harold Smith) (21 laps). The last hour of sprints produced fine racing. Won by a lap, the same distance separating second and third. Mileage, 1,939. America was fourth. Then came Denmark, Belgium, Holland, and the Germans, Merkins [Merkens} and Hurtgen, who were each fined £2 for wearing the wrong colours and jerseys. Canada was last. Sixteen thousand five hundred [16,500 or 65,000? - Ed] persons paid for admission. Five thousand were turned away last night, 12,000 being admitted though the prices were doubled. Many offered any price to get In. Scenes of delirious excitement were witnessed. The last hour's sprints produced marvellous racing, the spectators shouting themselves hoarse.